While it is possible to follow the map marker to Maglir, asking around town will net you some information as well: "The Bosmer? I've seen him at the West Weald Tavern. Been there for days, from what I hear. Better go see him." and even "Oh. Him. He's been around. Mostly at the West Weald staring at the bottom of a flagon of ale." Inside the West Weald Inn you will find Maglir hanging out in the bar, doing absolutely nothing. When approached he will claim to be underpaid and will explain that he was supposed to pick up Brenus Astis' Journal - which was reported to be in Fallen Rock Cave - and will show signs of things to come: "If you care that much, you go find it. The contract's yours. It's not worth it for what the Guild is paying. I've got a family to think about." Although it is painfully clear that Maglir is not Fighters Guild material, Fallen Rock Cave turns out to be filled to the brink with undead enemies, so be on your guard. The diary can easily be reached by following the map marker to the northernmost chamber and jumping down the pit (see this section for details). 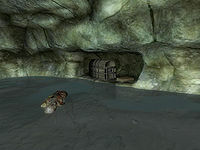 Proceed north through the narrow tunnel to a small water-filled room with a minor loot chest in an alcove and a dead zombie. The diary sits right next to the chest so pick it up, backtrack to the entrance then read the latest quest update and decide what to do next. With the diary in hand, you can either travel to Skingrad for another chat with Maglir or go straight to Modryn Oreyn in Chorrol and deliver the diary. Talking to Maglir at this point makes no difference and the coward Bosmer will even pretend he doesn’t care whether you tell Modryn the truth and proceed to ramble about his family and the low paycheck. In Chorrol, Modryn Oreyn will be quick to ask you what happened in Skingrad. Even if Maglir seemed indifferent, your answer will affect the More Unfinished Business quest, when Maglir defaults on yet another contract in Bravil. At the very back of Fallen Rock Cave is a dead-end where rocks are scripted to fall down on top of you if you enter the corridor. IF the rocks don't actually fall and you make it to the wall at the dead-end, it can lead to a crash to desktop. If the rocks don't fall and you save at the end BEFORE the crash, loading from the save will have the rocks in-place, trapping you. To prevent a possible game corruption, reload an earlier save and/or avoid the dead-end vs. using the "tcl" console command. Issue is present with UOP 3.5.2. in place. Esta página foi modificada pela última vez à(s) 08h06min de 18 de julho de 2015.